Terracotta Army - In 1974, some farmers were digging a well near the city of Xi'an when they unearthed some very old pottery. They contacted local authorities and a group of scientists were sent to the area and started excavating the site. What they uncovered turned out to be one of the greatest archaeological finds in history. A literal army of terracotta soldiers and horses dating from the time of the Qin Dynasty. When the dig was complete, over 8,000 life-size warriors, 130 chariots pulled by 520 horse, and 150 cavalry horses were found. In addition, several non-military figures, such as musicians and acrobats were found. Qin Shĭ Huángdi had them built to protect him in the afterlife. They were located in the emperor's mausoleum complex which was modeled after his palace. Despite not being found until the 20th century, the army's existence must have been known since ancient times since Sima Qian writes about it in his Shiji. According to him, work on the site began in 246 B.C., shortly after Zheng became emperor. The work involved 700,000 artisans and took 38 years to complete, which would have been two years after his death. 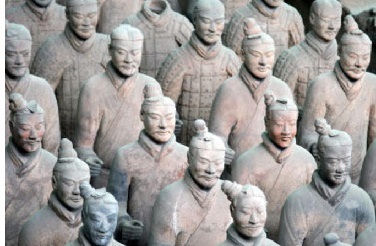 Initially it was thought that each soldier had a unique facial expression, but it was later discovered that their faces were based on 10 different moulds, and a few minor adjustments made to their features with clay. The necropolis is so vast that more figures likely lie buried and complete excavation of the site may never be possible.